Cash is king. Money laundering, fraud needs scrutiny, always investigate. It’s about time! Wow! IF only they had gotten a clue in 2007. 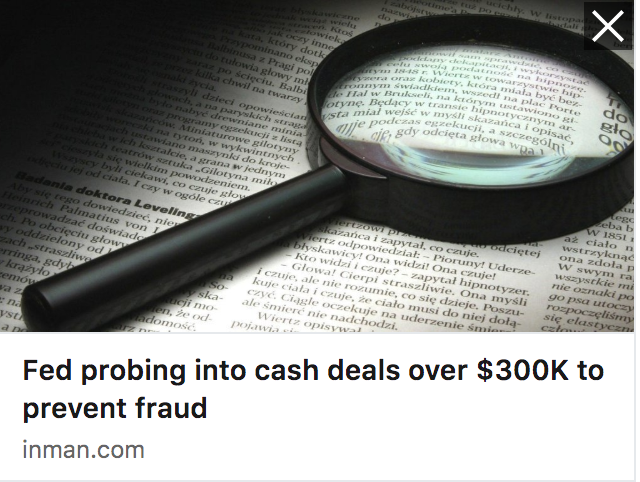 Recently at our Realtor Association Conference, security experts, provided words of caution…as it relates to wire transfer fraud incidents happening more frequently in Real Estate transactions. I have had several cash transactions and they truly are a breeze! It’s understandable how this could go unchallenged for so long. I mean if you had the choice between a lollipop and a boiled egg, which would you choose? The rub I had, is when the bank statement was delivered, (provided due to the language in the purchase contract…that I insisted upon being included, to protect the seller) was in Chinese. In my opinion, it was a mandatory requirement. The necessity of the purchaser, to confirm his financial qualification should be a no brainer. Do you know I could not get an attorney to confirm the amount of deposits on the statement? Not one. Now, reel in the response from the panelists…”Well, it all gets converted to U.S. currency, so there’s no problem.” Duh! Don’t you hate to ask an important question and get that response? I mean seriously. How many unfettered cash sales have taken advantage of residents in The United States…tax paying citizens? You’re thinking…Oh, these sellers got cash. What disadvantage faced them? Well, if you had sellers that lost significant equity in their personal property…their personal residence – Home. Oft due to no fault of their own. A “bubble” that burst. Picture those beaten down homeowners, selling for below their investment; just to get out from under their burden. They were hungry. They were given a lollipop.